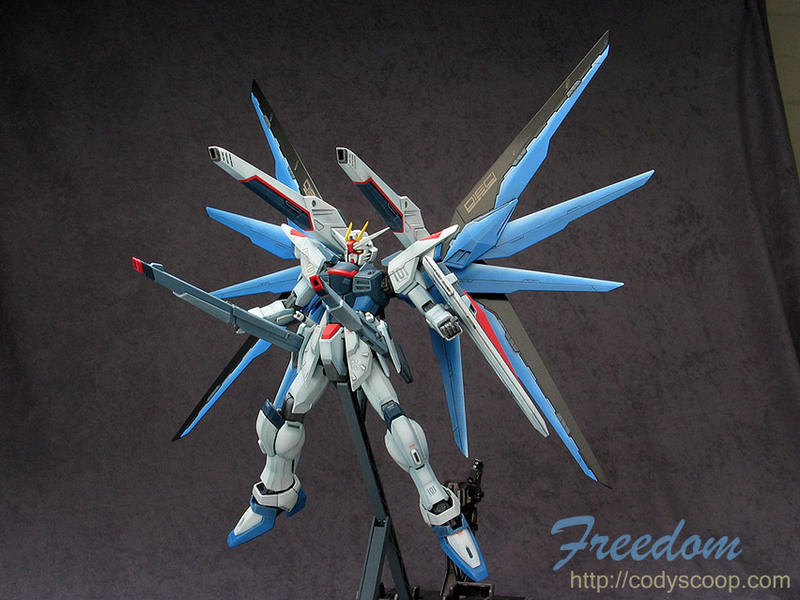 The Freedom became the main hero mech in the second half of Gundam Seed and the first half of Seed Destiny. It was pretty invincible in all, except experienced some difficulty fighting Providence and got whacked by a very smart Shinn in his Impulse. Despite the general discontent with Seed Destiny, I find it very enjoyable as a series – I think it has very strong story-telling and things mostly follow logical sequences. The same cannot be said for the original series (in paritcular Zeta), in which random people gets into mechs, ran out, and got killed. Then people just got angry and kill each other. The whacking of Freedom, for instance, took some effort by Rey and Shinn to figure out Freedom’s weakness, while Shinn exploited Impulse’s strength. The writers spent some effort in explaining the good points of a core-block system… yes we all know it’s a gimmick to sell toys, but in the show it did demonstrate why it was a good idea. After Impulse head got destroyed by Freedom, Shinn just replaced it with new ones, and also it avoided getting hit by separating upper and lower halves. So it did beat Kira square and fair, without the usual trick of hostages and stuff. Seems like I went completely off-topic 😀 I like the Freedom quite a bit, although I still like the Strike line better (Strike, Aegis, Akatsuki…), as the other designer in the series, Junichi Akutsu, is more in touch with the modern designs 🙂 However the Freedom is still pretty good as a recent Okawara design. The wing/cannon/rail gun combo is quite nice, and the main body of the robot is ok. The thing I don’t like about it are the shoulder pad armor, which sport a very un-streamlined shape, which I think really hurt the design’s dynamics. The feet were also a bit odd. So these are the main things I tackle when I build the kit. While the kit is very nice, and the proportions are much better than the HG and 1/60 kits, there are a few problems with the kit. First, the waist is too long, which makes the Freedom looks stretched in a weird way. Then, the railguns are too small – yes they’re long, but somehow you can’t help but feel they’re toothpicks after they unfold. The HG kit have slightly more beefed up guns. So these are the two things I want fixed. The shoulder pads were elongated , so that it’ll tapered off at the ends, and the red parts are not so close to the ends. I added some blocks to “raise” the shoulder pads. I didn’t like the shoulder pads tapering off at both ends. Usually shoulder pads don’t taper off towards the body like the original Freedom do. The groin axis was lowered by 5mm. I beefed up the railguns with plaboards. I couldn’t easily beef up the whole gun since that’d intervene with many parts, but it’s much easier if I just add volume to parts of the guns to create more lines and volumes to the guns, so that they don’t appear toothpick-ish. The feet were lengthed and squared off. The waist were shorted and a double joint was inserted in the middle. Turns out it’s extremely difficult to make the upperbody balance with the huge wings, so the double joints were reinforced with brass wires.